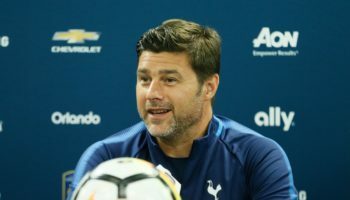 NEW YORK — In terms of distance, no road trip would separate the Vancouver Whitecaps from their home base in the 2018 season further than their venture into the Bronx on Saturday. When comparing Vancouver’s less-than-stellar away form and New York’s imperious home record, the separation between the two seemed worlds apart. 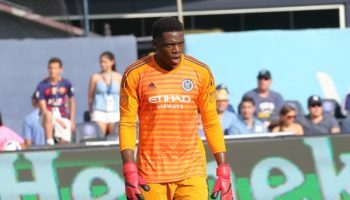 Nothing separated the two teams after 90 minutes, however, as an 87th-minute equalizer from Erik Hurtado allowed the Whitecaps to come away a point in a 2-2 draw against New York City FC at Yankee Stadium. 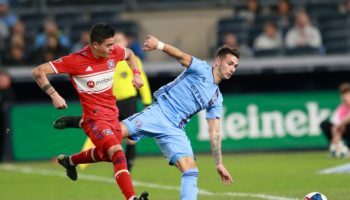 Though Vancouver was not able to come away with the win, its result was only the second occurrence all season that NYCFC did not come away with a victory in its 12 games at home this season (10-0-2). 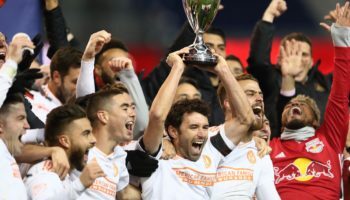 The Whitecaps, who fell behind 2-1 after New York scored in first-half stoppage time and in the first minute of the second half, were able to turn the game around in the final 30 minutes to get a well-earned result. Possession was hard to come by all game for Vancouver, but they tripled their shot total in the second half (six) from the first half, and evened the game when midfielder Russell Teibert started a counter attack at midfield with a pass out wide to fellow midfielder Brek Shea. From there, Shea sent in a perfect cross that the met by the right foot of Hurtado, who volleyed home a shot past NYCFC goalkeeper Brad Stuver to even the score late in the game. 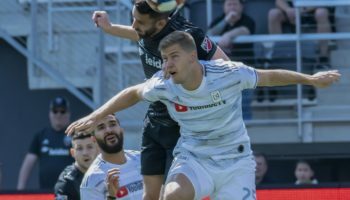 For the sixth time this season, the Whitecaps were able to rescue at least a point from a losing position, with the last five instances resulting in draws. New York dominated possession, holding the ball for over 72 percent of the contest, but were not able to put away Vancouver, resulting in the first home game without a win since their 1-1 draw against Atlanta on June 9. NYCFC was made to pay early for not converting their possession into a goal in the 22nd minute, as Vancouver midfielder Nicolas Mezquida gained possession of the ball at midfield and ran at the New York back line before unleashing a right-footed screamer past Stuver and into the lower right corner to give the Whitecaps the lead. Against the run of play, Vancouver took the lead, but the momentum stayed with NYCFC, who came close a number of times to equalizing towards the end of the half, including a bicycle kick from forward Ismael Tajouri-Shradi that glanced off the crossbar. The breakthrough came just after the 45th minute, as Tajouri-Shradi played in defender Anton Tinnerholm, who made an overlapping run on the edge of the penalty area to the right before pulling a pass back to forward Jesus Medina. After receiving the pass, Medina made a quick move to his right before his low shot went through the legs of goalkeeper Stefan Marinovic to even the score right before the first-half whistle. NYCFC carried the momentum into the second half and, almost immediately after the restart, took their first lead. Forward Jo Inge Berget found himself free on the left before his low cross was tapped home by new acquisition Valentin Castellanos, a 19-year-old Argentine attacking midfielder on loan from Uruguayan club Club Atletico Torque, making his debut with the team and in Major League Soccer. New York outshot Vancouver 22-8, with 15 of their shots coming from inside the box, and had 13 corners compared to the Whitecaps’ two. The draw snapped a three-game road losing streak for Vancouver, dating back to a 2-1 win in Colorado on the first of June.